Ganesh with his trustworthy mouse for transporation. God of good enterprises, Ganesh can clear a path in the jungle while his mouse slips through the smallest of holes. 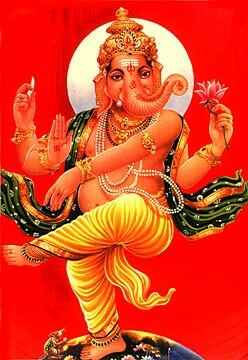 Here Ganesh is shown in the pose of "Nataraja" which means king of dance (not elvis). Nataraja is the name of Shiva, who is Ganesh's father. All dancers in India pray to Nataraja.